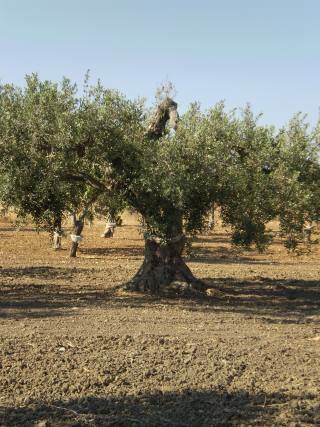 Olive Nocellara del Belice is a variety of olive tree that grows only in Valle del Belice to Castelvetrano Selinunte hectares and production. An olive dual attitude, that is capable of producing both table olives for oil. Oil Nocellara del Belice is an olive oil produced by the olive variety "Nocellara del Belice" one of the most valuable and prestigious of the world. Oil falls in the category D.O.P. (Protected Designation of Origin) the only recognized for table olives at the European level, also recently received the mark PGI (Protected Geographical Indication). Nocellara presents a maximum of 0.50% and an average density value. 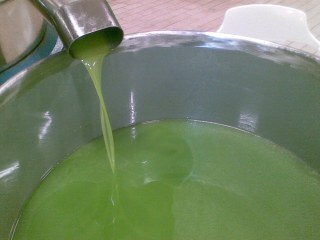 Its color is green with shades of yellow gold and has a fragrance oil just shattered with hints of grass. Its taste is fruity, just slightly bitter and spicy with a hint of almond, and unparalleled valuable on the palate. Nocellara is done solely by hand, with the method of brucatura. The collection period begins in late September and continues to October, November when campaigns are Castelvetrano fill of men and women who like a big party in an ancient ritual of thousands of years collecting the precious fruit by hand between the fronds of silver-green leaves of that Nocellara. The collection, to limit waste oil and obtain valuable, is made in the phase called invaiatura result of, because drupa is beginning the process of aging. Olives make about 19% oil, it can be extracted with systems traditional milling with a continuous cycle cold within 24 hours after delivery to the oil. < u>Curiosity: Olive oil is the only one that can be achieved by simply squeezing the fruit, without any chemical manipulation. Nocellara The olive tree is one of these ancient lands is always represents marks and traditions, history and the economy. Secular olive trees nocellari ombreggiavano Indeed breaks of the workers involved in mining in the Cave of Cusa stone for the construction of the city of Selinunte. Grosse mill grinders of found in archaeological area of Selinunte, testify processing olives already 500 years before Christ. Selinunte of these grinders distributed them widely used, and Oil Nocellara was already the subject of trade with the entire Ancient world, just to confirm the position which emporium of Selinunte 'Oil of antiquity. 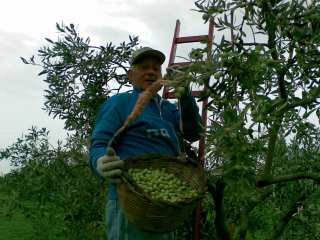 Right here to Selinunte, the cultivation of that with the selection of "cultivars Nocellara del Belice", environmental conditions found in crops so be done only lead oil of Castelvetrano olives, since then, in absolute level on the tables of real connoisseurs from all over the world. Extra virgin olive oil Nocellara del Belice, is consumed raw brick. Good to be used for raw soups, past vegetable, salad, in cooking is delicious for the preparation of sauces, roasts both of meat or fish but also for fried, as its point of smoking is higher than in all other oils. Olives very large and rich in pulp are suitable for meals and snacks can be prepared in various ways, the brine, crushed and seasoned with oil and pieces of garlic or simply in brine, a variant particularly appreciated is the olive black, the so-called "passuluni", which is the drupa is collected when taking a couple very colorful black, then is put under oil and salt and crushed with weights or presses, it is delicious to taste food and salads. The qualities of this oil nocellara undoubtedly make one of the best ever, Prince element in a balanced diet but attentive to taste such as Mediterranean, recognized worldwide as the best available. Numerous studies have demonstrated the qualities of extraordinary 'olive oil able to: reduce cholesterol, risk of occlusion of arteries, the blood pressure, the rate of blood sugar, arteriosclerosis, myocardial infarction, etc. ... Oil extra nocellara in fact possess highly digestible fat. We just have to wish you a good appetite and a healthy with olive oil and extra virgin olive Nocellara del Belice of Selinunte Castelvatrano. Curiosity: an excellent way to degustarlo Oil Nocellara del Belice is in the typical recipe prepared with Bread Black of Castelvetrano said in Sicilian dialect "Lu Pani Cunsatu".